collection. 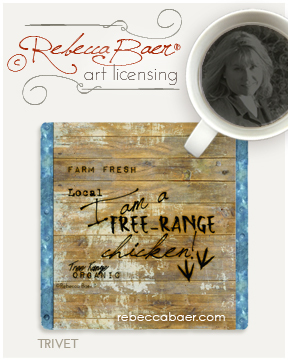 Along with the on-trend topics of organic, farm fresh and local, this compilation includes a variety of watercolor roosters and hens on rustic crate-like signs. These are accompanied by signs sporting clever quips, many from the chickens' point of view. It's always fun and exciting to be able to offer products bearing my art. This series has personal significance because we have chickens of our own. They each have unique personalities, which were the inspiration for this collection. I call it "Chicken Speak". It includes an array of home decor accents, coasters, trivets and more. I can't offer everything on the website so I've selected a range of coasters and trivets with different images and sayings. I am pleased to be able to say that these are all American made. They make wonderful gifts and are very reasonably priced. I have only ordered a limited number of each so get your favorites while you can. There are three pages of trivets and coasters so relax, pour your favorite beverage and shop for all of those special occasions coming up--and don't forget to treat yourself. We have two weddings coming up and I think these would be ideal additions to a gift basket. The theme could be kitchen with a trivet, dish linens and kitchen tools or a trivet, coasters, glassware and placemats for a dining motif. For a coffee lover you might pair coasters with mugs and a bag of coffee plus add a trivet for the pot. There are many possible combinations. Coming up with the plan is half the fun! 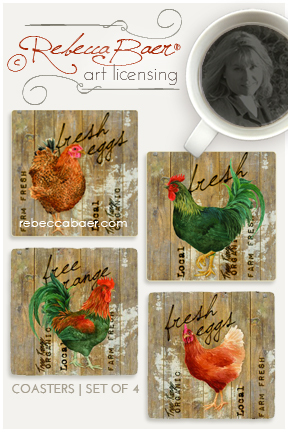 Licensing is one of the ways I rely on my art to make a living. Being able to offer unique items from time to time is a bonus and I sincerely appreciate every purchase. Thank You!